Because it is going to take significantly more programming time than I initially planned, mainly because I keep adding in new features, I have decided to do a small update to Envelope Print v2.57. I have been doing small fixes to the program over the past year, but had not released those versions to the public as the changes were fairly minor. Needless to say, I have decided to make a new public release that incorporates all of the fixes plus a few new features. The release will be version 2.80 and not v2.60 as versions 2.60-2.79 were all minor bug fixes over the past several months that were never formalized and released to the public. Version 2.80 will be released in the next few days, beginning of next week at the latest. Overall, this version corrects problems with some printers, corrects blank records from being added to the address file, allows for printing Return Address only envelops, provides a streamlined multiple copy print function, does away with the number of copies to print pop-up in the Pro version, allows users of the Pro version to add a 250 x 250 pixel logo/picture to the left of the Return address. 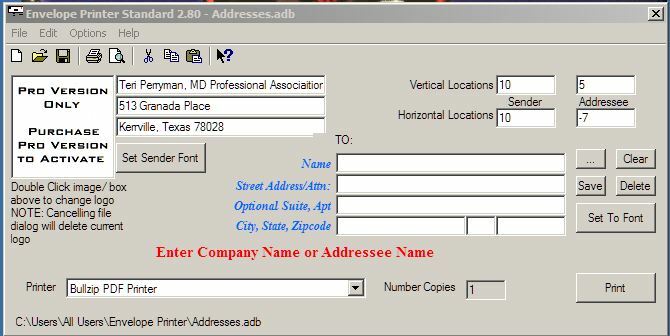 Notice in the upper right corner the ability to add a logo or image to your Return Address. This image is 250 x 250 pixels in size. If you use a large photo it will be resized. I am not saying that a large photo will look good at the resized dimensions, just saying the program will auto-resize as needed. The logo/picture will print in color if it is color and you use a color printer, otherwise it will be black and white on a standard printer. Here is a sample of the output from the Pro version with the logo. Hard to tell the Boogerman is a Boogerman, but you can tell it is in color. I may be changing the size of the logo from 250x250 to 300x300 or 400x400 after more testing is completed. Other changes include, the About button has been removed to enlarge the printer selection drop-down and make room for the Number of Copies to print box. In the standard version the Number Copies is set at 1 and can not be modified. In the Pro version there will no longer be a pop-up box asking for the number of copies to print. The purpose of this change is again to make the program that much easier and faster to use by eliminating an extra window and click by the end user. Other than those two major changes the program is currently the same as in the past, other than behind the scenes changes that fix reported bugs and problems. For non-Pro users your main interface window will look like this. Double-clicking the image box will be the same as clicking on Help->Purchase PRO. Also notice the "Number Copies" box at the bottom is greyed out and is a read-only box. Again, just doing some final testing over the next few days and will be getting the update ready for release near the end of this week or start of next week. Might end up being a Memorial Day release as I will have extra time this weekend to get everything prepared.